Concrete admixtures from Saudi-based Arkaz, which have been developed to suit for the region’s harsh climate and improve the flow and strength of concrete, are playing a key role on a major project in Makkah, Saudi Arabia. The project calls for the construction of road and infrastructure as part of the King Abdul Aziz Road (KAAR) scheme. Located in the western part of Makkah city, KAAR extends over 1.2 million sq m from the western entrance of Makkah (the intersection of Jeddah Highway with the Third Ring Road) to Jabal Omar project. The scope of work includes 9.5 km of roads, a 60-m-wide pedestrian boulevard, public realm, street furniture, retail facilities, landscape and hardscape, four multi-storey public parking structures, bridges, overpasses, underpasses, highway structures, retaining walls, bus rapid transit (BRT) facilities/infrastructure, metro stations and lines (core and shell) and utilities including water distribution and collection, fire-fighting and stormwater drainage systems, and electrical, mechanical and telecommunication networks, according to Dyaa Badran, admixture sales manager – Western region. “The project is currently in the construction stage, with concrete pouring under way and it is targeted for completion in 2020,” Badran tells Gulf Construction. 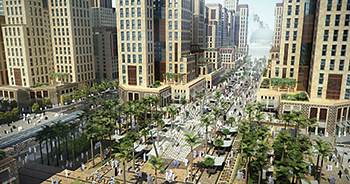 “The KAAR development project fully supports upgrading the existing infrastructure, creating a major movement axis in Makkah, complementing a prominent gateway to the holy city – specifically the haram area – and deploying future transportation technologies. The project is a unique urban scheme to support religious, social and commercial activities all year round,” he continues. Arkaz worked with the contractor Nesma & Partners and Saudi Readymix, the concrete supplier, at the very early stages of the project, conducting various concrete trials to assess available raw materials and produce the required concrete mix design. This proposed solution provided the client with the required high-quality results using different concrete admixtures. These included Arcrete SP157 (superplasticiser) and Arcrete D8 (retarder), as well as Arcrete WP and Arcleaner. “Arcrete SP157 and Arcrete D8 admixtures were added to concrete in order to reduce the water content in the mixture or to slow the setting rate of concrete while retaining the flowing properties of the concrete mixture. Both products provide improved compressive strengths and flow of concrete as they are highly flexible and effective over a wide range of cement contents and types,” he adds. “The products are also suitable for hot climatic conditions,” he explains. He says Arkaz’s durability-enhancing admixtures include Arcrete SP157 and the Arcrete WP waterproofing admixture. Badran adds that the client was very satisfied with the support provided by Arkaz’s team particularly its clear application instructions. The team provided the client a comprehensive solution – from concrete mixing to the final placement of the concrete. “Arkaz solution was cost-efficient, highly productive and minimised any rejections or reworks,” Badran concludes.